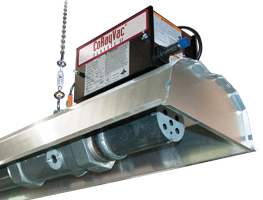 The original combustion condensing vacuum-fired CoRayVac® system with over 40 years of experience. Burners fire in series for the most even heating and highest efficiency in the business. System inputs from 20M BTU/hr. to 1,000M BTU/hr. Single system lengths from 40 feet to 450 feet. Standard Roberts-Gordon three year warranty. Fantastic choice where high efficiency, and comfort are important, such as aircraft maintenance facilities, bus garages, manufacturing plants, automotive shops, and package distribution hubs. CoRayVac® for heating CNG and LNG facilties. Compressed Natural Gas and Liquified Natural Gas facilitates have unique requirements. When you are running a CNG fleet of vehicles, your maintenance shops can’t be heated by conventional means. 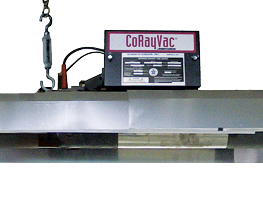 The CoRayVac® SF is the solution! It provides energy efficient comfort while meeting the NFPA 30A 7.6.6 standard. Available with 40M BTU, 60M BTU, and 80M BTU burners. The only way to heat facilities with CNG vehicles efficiently and comfortably, while meeting NFPA safety standards.